I think this piece is awesome! How many times in your life do you get to see a 45' clothespin! I mean, its amazing. It stands in the Center Square of Philadelphia. It was create by Claes Oldenburg in 1976. 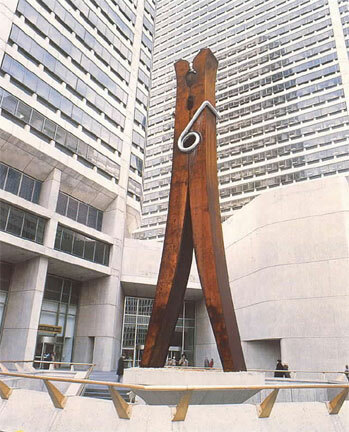 I have been to Philly quite a few times in my life but have somehow missed a 45' clothespin when I am there. It is made of steel with a steel base and it just a true fascination for the eye. This is the kind of stuff you can't make up. If you do not believe this, something that must have taken hours to recreate is not art, then you don't know true art.